As a social activist, filmmaker, artist, photographer, composer, and performer, Associate Professor John Jota Leaños, who teaches Social Documentation at the UC Santa Cruz Film and Digital Media department, is not afraid to take on hot-button topics via his art – topics that have garnered him national attention and even, at one point, incited death threats. Leaños’s acclaimed animated films include the documentary Frontera! Revolt and Rebellion on the Rio Grande , which chronicled the events leading to the 1680 Pueblo Revolt in what is now Arizona and New Mexico, and premiered on PBS in 2014 and won Best Animation at the 39th Annual American Indian Film Festival. His latest animated film project, ¡Eureka!, has just been granted awards from The National Association of Latino Arts and Cultures (NALAC) and The San Francisco Foundation Bay Area Documentary Fund, and it recently won the Cal Humanities// California Documentary Project Research and Development award. Like Frontera!, ¡Eureka! uses animation, music and humor to weave an alternative social history of California, tracing key moments of colonial California and the development of the West from Native and Latina/o perspectives. It touches on topics of migration, displacement and racial tension that shaped the American West. “The story of the California Indian genocide has to be told." Inspired by School House Rock!, Leaños uses music and animation to tell history. He has been energized by the new Broadway hit, Hamilton, and will be using more musical pieces in ¡Eureka!. Currently, Leaños is focused on researching, listening to stories about the era, developing characters, putting the script together and developing the music. Next, he will work with a team to do drawings, animate and have the trailer done by fall. Born to a Mexican-Native-American father and Italian-Lithuanian-American mother in California’s Inland Empire, Leaños identifies his heritage as from a California tribe of Mexitaliano Xicangüero Mestizos called “Los Mixtupos” or Xican@s.
“You gather whatever resources you have and make it all work." Growing up in a working-class family where is father kept the family afloat with several jobs, Leaños often worked during the evenings with his dad. “It was interesting,” he reflects, “because in high school, if you’re doing janitorial work three days a week and on weekends, you don’t really want to tell your friends because it’s not such a cool job. To make things worse, I didn’t get paid because I was working to help my family, but the benefits came much later because I developed a Chicano work ethic that planted in me during that time. “You gather whatever resources you have and make it all work. That attitude has been with me throughout my career, and in some ways I trace it back to my father, who performed a constant hustle in order to survive as a Mexican-Chumash man providing for his family Los Angeles. Like my dad, I’m too down for the hustle, but for me it’s an artist hustle. Leaños moved to San Francisco after being accepted at San Francisco State University where he studied Humanities. A few years later, he earned an MFA in photography there, and also got involved with the famous Galería de la Raza, the longest-standing Chicana/o arts nonprofits in the West. The arts/social justice organization located in San Francisco’s Mission District, fosters public awareness about Chicano/Latino art and that supports Latino artists in all mediums. Beginning his artistic career as a photographer, Leaños was interested in the public uses of photography and began the Galería’s Digital Mural Project with Carolina Ponce de León on a former advertising billboard space that was on the outside wall of the Galeria. The space had been notoriously overtaken years earlier by local Chicano artists becoming the first community mural program in the United States. “We started a digital mural project there in 1999 and commissioned artists to make digital mixed media murals….”, explains Leaños. During that time through 2003, Leaños also became part of an artistic collective called Los Cybrids which was dedicated to critiquing cyber-cultural negotiation through tecno-artistico activity. Along with artists Rene Garcia and Praba Pilar, the group used performance, burla and high-tech art to bring awareness to the pervasive and unacknowledged social, cultural and environmental consequences of information technology. “We were interested in the critique of technology during the dot com boom,” says Leaños. “There was a lot of activism around gentrification and displacement in San Francisco and Silicon Valley caused by capital investment into tech start-ups and we began examining the undercurrents of technology and its role in globalization, exploitation of foreign workforces, racialization, policing and incarceration…its use to generate a flow of global capital and information to the benefit of corporations.… All of this informed our work, and we approached it from Latina/o perspectives. “For us, art is inherently political. Cultural expression becomes political. Chicana/o” artists don’t really have a choice – being a political is embedded into a declaring Xican@ as an identity." From 2003-2007, Leaños was an Assistant Professor of Chicana/o Studies at Arizona State University. It was also during this time, in 2004, that he found himself mired in a heated national controversy that brought on an onslaught of death threats and viciousness that he never thought possible. He was teaching and working on his first animated film, Los ABCs, as the national headlines were proclaiming that professional football player and Arizona State alum, Pat Tillman had been killed while serving in the US Army in Afghanistan. The initial reports from the US government said that Tillman had died by enemy fire and much was made of him being an American hero, especially since he had left a successful football career behind to serve. However, later reports revealed that Tillman actually had been killed by “friendly fire” and was shot accidentally by his fellow soldiers, exposing serious misconduct by US military. Tillman’s family was outraged that their son had been used for military propaganda based on such deliberate deception, and the national media had a field day when the true details started trickling out. There were even rumors that Tillman was deliberately targeted because he was due to return to the States soon where he planned to come out against the war. 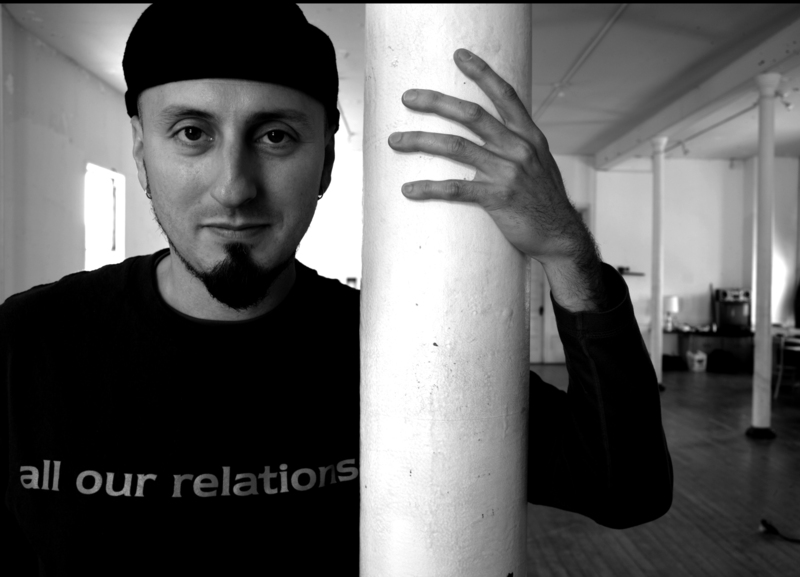 Leaños has developed many other successful projects as well, including writing and directing a four-act mariachi opera called Imperial Silence: Una Ópera Muerta (A Dead Opera in Four Acts) that fuses dark-humored animation with Mexican baile folklórico, modern dance, mariachi music, hip-hop, and borderlands blues. His awards are numerous, too, including a Guggenheim Fellowship in 2012, a United States Artist Fellowship in 2011 and a Creative Capital Foundation Grantee in 2002. His work has been shown at the 2002 Whitney Biennial, the Museum of Contemporary Art, Chicago, the San Francisco Museum of Modern Art, Museum of Contemporary Art in Los Angeles, and Massachusetts Institute of Technology, among others. His next animation installation is slated for the Denver Art Museum in 2017. Now, as Leaños continues to focus on documentary animation that tells a side of history we rarely hear about or learn about in school, his seventh film, ¡Eureka!, is a testament to the tremendous amount of research and dedication it takes to tell these very important, though hidden and heart wrenching, historical accounts. With documentary filmmaking becoming such an expansive medium, he looks forward to teaching his students the many ways they can use documentary for transformative storytelling, social engagement and art. He’s also enjoying training students in animation techniques and wants to ensure they have as many related skills as possible.